The versatile Laudate Singers joins forces with renowned jazz saxophonists Campbell Ryga and Ross Taggart and talented synthesizer player Tim Tsang in this extraordinary concert which will exhilarate both the traditionalist and the adventurous music-lover. In the spirit of the Hilliard Ensemble’s 1994 recording Officium with jazz saxophonist Jan Garborek, Laudate Singers will perform Renaissance gems by Palestrina, Dufay & Byrd accompanied by the improvisations of Ryga and Taggart. 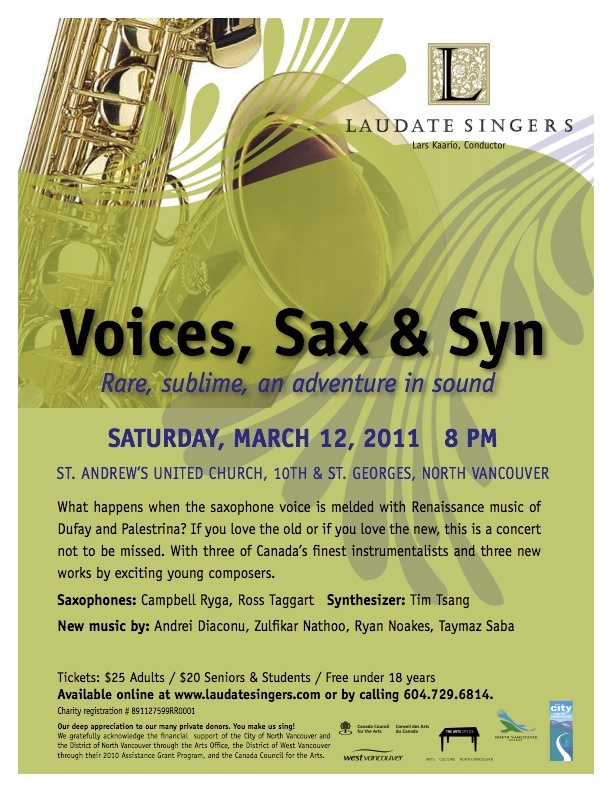 Dazzling new pieces written especially for Laudate Singers and the instrumentalists by four Vancouver composers round out the program. More information, including sample soundbytes at www.laudatesingers.com. A video about the creation of this concert will be available soon!